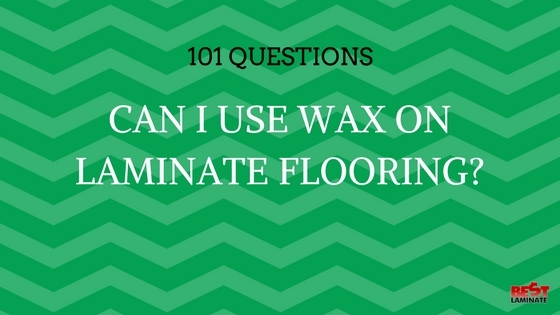 Home >> 101 Questions Series >> 101 Laminate Flooring >> Can I Use Wax On Laminate Flooring? Laminate flooring is not like hardwood flooring. Yes, both are made out of wood, but the maintenance of the two is completely different. 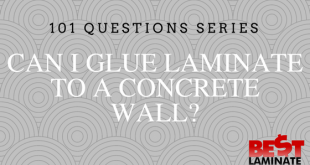 Which begs the question if you should use wax on laminate flooring. Unlike hardwood, if you use wax on laminate flooring it doesn’t make it shine. Using wax on laminate flooring can cause a buildup of dirt and actually does the opposite of what it does on hardwood. Instead of the wax making your floor shine, wax makes your laminate flooring look cloudy and dull. Stick with a laminate floor cleaner or vinegar and water to clean your laminate. Be cautious of laminate flooring cleaners though. Always read the back label of all your cleaning supplies to make sure wax is not an ingredient as well. Some companies are just as misguided – thinking that wax will help make laminate looking new – when in reality, it’s a detrimental component to keeping laminate floors looking sparkling new. Use a simple solution of 1 cup white vinegar to 1 gallon of warm water and your laminate floors will continue to look good as new! Learn more about clean and maintain your laminate flooring here. My floor is Laminate with a low gloss. Can I use Bona cleaner on my floor? Hi Marina, thanks for reaching out. Each wax is a bit different, so we generally recommend reaching out to the manufacturer of the wax you used and see what they recommend for laminate flooring to avoid any surface damage. I used vinegar and water and it left my floors very dull looking and an odd residue. Still looking for a good floor cleaner that will not leave a strange residue on my vinyl plank flooring. Hi Lori, thanks for the comment. I am surprised to hear the vinegar and water solution did not work for you! We’d recommend trying dish soap with water if you have a residue build up. Other than that, you can find household cleaners specific to vinyl flooring almost anywhere. We have not personally tested any brands to recommend. I used quick shine deep cleaner and wax remover to remove the quick shine floor finish that I put on my lamenete floors thet caused a build up. Used a brush and a scrubbed pad to remove the old wax and worked great. Now I am not going to put ant wax back on the floors. Hi Carolyn, sorry to hear about the Orange Glo problem! We have no tried this personally, but it seems Windex will help remove it! Be sure to get the ammonia free kind. Try it on a small patch to test it out! What can you use to take wax off of Laminate floors? Hi Kim, thanks for your comment. We recommend reaching out to the manufacturer of the wax that you used on your flooring. Typically, they will be able to provide the best product or solution to remove their specific wax from your laminate flooring. Does not work, the floors are less than a year old and look like crap. Hi Herb, thanks for your comment. Did you use wax on your laminate flooring? Unfortunately, this can make your floors look cloudy and dull. We recommend using water and vinegar to clean your flooring. Vinegar is a natural disinfectant and will leave your floors fresh and clean! Thanks for the information.Keep sharing such kind of blogs!